British Prime Minister Theresa May leaves after addressing a media conference at an EU summit in Brussels, March 22, 2019. In the past two years, British Prime Minister Theresa May has insisted repeatedly that Britain will exit the European Union on schedule on March 29 — she has said so 108 times from the dispatch box in the House of Commons. 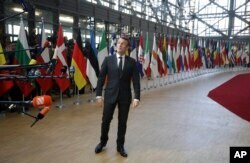 French President Emmanuel Macron speaks with the media as he arrives for an EU summit in Brussels, March 21, 2019. His foreign minister, Jean-Yves Le Drian, told the French National Assembly on the eve of a two-day EU summit in Brussels this week that France would oppose a lengthy Brexit postponement. He said Paris would only support a short extension, one giving the British parliament sufficient time to approve a contentious withdrawal agreement May and the EU agreed to in November — but one that British lawmakers have overwhelmingly rejected twice. Without that approval, "the central scenario is a no-deal exit — we are ready for it," the foreign minister said. 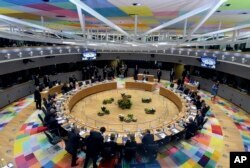 European Union leaders attend a roundtable meeting at an EU summit in Brussels, March 21, 2019. 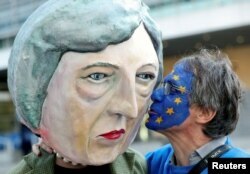 An anti-Brexit demonstrator kisses a protester dressed as Britain's Prime Minister Theresa May ahead of a EU Summit in Brussels, Belgium, March 21, 2019.